If the Tar Heels are truly a great road team, they’ll have to show it. Carolina has nothing to complain about with its No. 1 seed in the Midwest Region, although it would have been interesting to see if anything changed with a win over Duke instead of a one-point loss at the buzzer. The 2018 and 2019 season was different in terms of the team’s growth and progress. Before the New Year came three losses away from the Smith Center – to Texas in Las Vegas, at Michigan and to Kentucky in Chicago. After January 1, there were two home losses but a 9-0 record on the road. 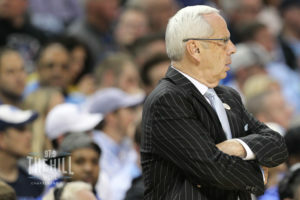 The ACC’s cockamamie schedule certainly helped the Heels, with seven of the nine road wins coming over teams that did not make the NCAA tournament. Those, plus victories at Louisville and Duke, had to develop confidence playing away from Chapel Hill. That should help going into Big Ten country in Columbus the first weekend and, with two wins there, heading for Kansas City, where the Road to the Final Four ended and Roy Williams was booed by KU fans in 2013. If Carolina reaches the Sweet 16 this season, it could be against the fourth-seeded Jayhawks, who did not win the Big 12 first time in 15 years and have their lowest seeding since 2006. The likely foe in an Elite Eight game would be a rematch with second seed Kentucky for a trip to the Final Four, just as it was in Memphis two years ago, when the Tar Heels disappointed a huge Big Blue throng on Luke Maye’s last second jumper. So, despite few prognosticators picking UNC to move on to Minneapolis, the Midwest may be an okay region. The 1-16 game against Iona should give Ol’ Roy’s staff some extra time to scout both Utah State and Washington for the second round. And some soothsayers are even picking Kansas to lose their second-round game to the Auburn-New Mexico State winner and not make it back to the Sprint Center, KU’s version of the Greensboro Coliseum. Regardless of the opponent, the Tar Heels will have to validate their success as road warriors in 2019. Bottom line is there is no unbeatable team in the entire field, no matter who and where they play. So their chances could be better than you think.